For persecuted early Christians, in language crafted to conceal its meaning from the persecutors, we hear a confident prediction of God's triumph. For communities struggling with doctrinal disputes and membership issues, a Christian sage offers some consoling advice at the highest level. Like a new Moses, Jesus ascends a mount in order to deliver a new law. It will contrast significantly with the old. The Historical Situation: The safest thing one can say about the Book of Revelation is that it was written to bolster the faith of persecuted Christians, and that its fantastic imagery is meant to conceal its true meaning from the persecutors. Without saying so too plainly, the book tells the faithful that even their persecutors are restrained by the hand of the invisible God whom the persecutors won't acknowledge. This scene, of multitudes of saints worshiping in heaven, tells the troubled Christians that their God is really the true God, and truly in charge in the long run. Proclaiming It: Your proclamation should capture the awe which the visionary John is trying to convey. He's telling us details of a scene we can't hope to witness in this life. It's not your grade school essay about your family's summer vacation. Read the passage to yourself several times and try to imagine the scene in your own mind. My father once said that when they make a movie of the Book of Revelation, it should be a Cecil B. DeMille production. Well, there's your assignment: All the grandeur of a Hollywood epic, conveyed with your voice alone. A Theological Reflection: Notice that there are two groups described as present in huge numbers: one from every tribe of the Israelites, and another from every race, nation, people and tongue. John understood that God's plan calls for the salvation of all people, Jews and Gentiles alike. This universalism was obnoxious to some Jews, and led to their throwing Christian Jews out of the synagogues. These Christian Jews felt deep grief at this separation, as well as uneasiness about mixing it up with pagans, even pagan Christians. (We must note that the persecutors mentioned above were not Jews but Romans.) John predicts the eventual reconciliation of Jews and Gentiles, and so encourages his readers to embrace each other in this life as they will in the next. some of whose members were advocating false doctrines (2:18f-26; 3:7). the threat posed by them remains (3:11). who came into the world as true man (4:2). and refusing to accept faith in Christ as the source of sanctification (1:6; 2:6-9). Thus they are denying the redemptive value of Jesus' death (5:6). All this is behind the disappointed admission that "the world does not recognize us" and the implication that it's not automatic that everyone "makes himself pure." Proclaiming It: The sentence structure is such that a slow, slow proclamation is in order. Let your voice express the connection between "us" and "him" [Jesus], as the two whom "the world" cannot recognize. And contrast the "now" with what "shall be". Without help from your preacher, your congregation won't know that background, won't choose a side in the conflict. But by your tone of voice you can make them wonder "what we shall become" that has not yet been revealed. You can make them suspect there's something to be proud of in the fact that the world doesn't understand us. You can make them want to be pure (although purity here is less about sexual morality than about a right understanding of Jesus as the Christ, and loving relationships with our sisters and brothers in Christ). 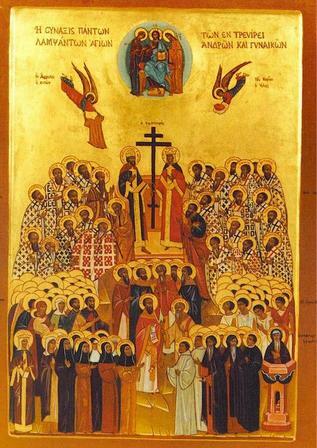 From the Orthodox Church, an icon of all saints. The picture is reproduced on many web pages, of which one very interesting is here, a page of icons of Eastern saints who evangelized the West "pre-schism", that is, before 1,000 A.D. 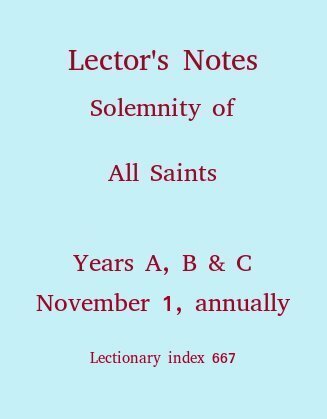 The page asserts that these form "an indicative but prayerful reminder to all the peoples of the present-day European Continent that our Holy Orthodox Faith, in the person of all the Saints who had evangelized its inhabitants during the first millennium A.D., is the only secure foundation upon which European unity should be built and continued." I disagree, but I accept the implied reproach of my ignorance about history, the Christian East and whatever efforts are under way to re-unite us.